We Provide Eye Exams, Contact Lens Fittings, and Specialized Lenses. Daily disposable contact lenses are the ultimate in convenience and are one of the healthiest options for your eyes. There is no need to clean them: just throw them away after each use. They are also ideal for traveling because you don’t need to bring contact lens solutions or cases, and you always have spare pairs. Hollywood Contact LensesIn many cases, you may see better with contacts than glasses. Our patients enjoy increased peripheral vision and crisper vision. Patients often tell us that they see more accurately with contact lenses because the lenses act as if they are part of your natural eyes. If I couldn’t wear contacts before, can I wear them now? Very few patients are unable to wear contact lenses because there are so many different types of lenses. Technology has continually improved the quality of lenses, so patients with difficulty conditions such as dry eyes, astigmatism and bifocals can now wear contacts. We can also counsel you on a nutritional program, and homeopathic medicine to stimulate increased natural tear production to help patients with dry eyes wear contact lenses longer, and more comfortably. Are Contact Lenses healthy for my eyes? Yes, Contact lenses are healthy to wear, and require very little maintenance, especially daily disposable contact lenses. Daily disposable contact lenses are the ultimate in health and convenience. There is no need to clean them: just throw them away after each use. Can Contact Lenses Protect Me if I’m Sensitive to Blue Light and Sunlight? With the latest Light Intelligent Technology, ACUVUE OASYS with Transitions can easily adapt to changing light conditions. 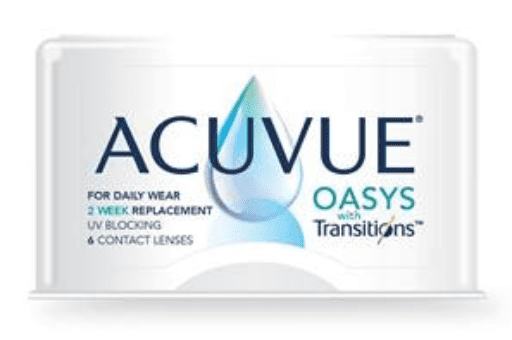 Most importantly, ACUVUE OASYS with Transitions help balance indoor and outdoor light entering the eye, including filtering blue light and blocking harmful UV rays. These "first of its kind" contact lenses are great for individuals who want the convenience of being able to wear prescription transition lenses without having to worry about losing their sunglasses. These contact lenses also protect your eyes from the harmful blue light that can harm your eyes from computers, cell phones, tablets and other digital devices. Do colored contact lenses look natural? Yes, new contact lens designs look extremely natural and beautiful, even when someone is gazing directly into your eyes. Many actresses and models wear colored contact lenses, and you can’t even tell! Why are hard or gas permeable (GP) contact lenses better for some patients? Patients with very dry eyes or high amounts of astigmatism can benefit from wearing GP contacts. GPs can also act as retainers to keep a patient from becoming too nearsighted. There have been studies showing that children wearing GPs can become less nearsighted than children not wearing them. Is it safe to wear contacts while playing sports? While swimming or scuba diving? It is safe to wear contacts for all sports. In fact, contact lens wear can enhance your athletic performance. We recommend wearing safety glasses, with shatter resistant polycarbonate lenses, over your contact lenses in sports such as racquetball, tennis or baseball, to protect you from being hit by a quickly flying object. Contact Lenses LAYes, and some patients even see better with contacts than their glasses. Gas permeable contact lenses can even decrease your astigmatism by “smoothing” out the cornea, or front surface of your eye. There are new and improved disposable contact lenses for high amounts of astigmatism, and patients who have need bifocals with astigmatism. How do actors in the movies change their eyes? We design special effects contact lenses for the movies and can transform you into an alien, a cat, or any other creature. We turned Shaq into the perfect free throw shooter in “Terminator 2 in 3D” at Universal Studios Hollywood with computer chip contact lenses. If I wear bifocal glasses, will I be able to read through my contacts? There are several options for bifocal wearers: disposable progressive lenses, monovision, bifocal contact with astigmatism, or wearing reading glasses over your contacts. Our patients who successfully wear multifocal contact lenses have told us that it is “liberating” to wear contact lenses, rather than constantly searching for their reading glasses. Multifocal contact lenses have multiple prescriptions, all in one lens. This helps you to see both near and far after 40 years old when we normally lose the ability to zoom in to focus. 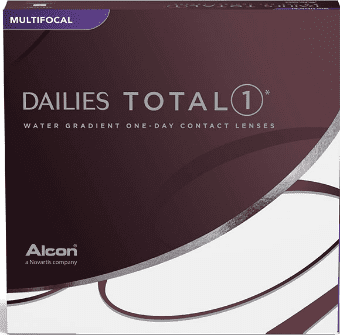 DAILIES TOTAL1 Multifocal contact lenses will leave you feeling like you're wearing nothing at all. Running errands, working on the computer or going about your day can all be done with the comfort of the world's only water gradient lenses. Give your eyes the comfort that they deserve today! Can contact lenses decrease my myopia and astigmatism without surgery? Yes, specially designed lenses called Orthokeratology, or Ortho K corneal molds can reshape your cornea without surgery, while you sleep, to decrease your myopia and astigmatism and need for glasses during the day. This is an excellent option for myopia up to -10.00 in children and adults. If you have a current contact lens prescription, you can order your contact lenses from our website.